My passion is designing web applications. Admin panels, billing apps, time management apps - you name it, I'll do it. 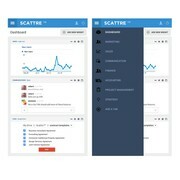 "Creating application design for Scattre (http://Scattre.com). Kim did a great job understanding the mockups and the further clarifications and was flexible when changing drafts. I can recommend Kim." "She developed the best design from day one. Her responses to feedback were precise and intuitive. When we do another contest we will make sure she gets a personal invitation." "Kim is a great designer, she is hard working and has excellent communication skills. I would highly recommend her to anyone. " "KimKiyaa delivered a nice design from the start. She then went on and refined it based on our feedback. After we awarded her the winner of the contest she helped out by applying the design to six different instances of the page it was designed for. All..."
"Kim was excellent at designing enterprise web applications. In my experience, there's definitely a specialization when it comes to apps and she's very good at making professional enterprise apps." "We are extremely pleased with the work provided by KimKiyaa. Her designs were intuitive, clean, and stylish, and she quickly understood what we were looking for in terms of navigation, organization and appearance. " "Kim did an awesome job! We will continue to have her design more pages for us." "Kim gave us a variety of great designs. She's very talented. She went above and beyond our expectations! We are very pleased with the quality of her work, and would gladly work with her again." "Kim was great. She happily made any changes we requested and provided us with exactly what we hoped to get when we launched the contest!" "I'm very pleased with the final design provided by KimKiyaa and what I cherish the most is how we got to the final product. Kim took the time to really read the brief, asked for the right complementary questions then reviewed all the referenced designs ..."
"From the beginning of the contest, Kim presented designs that captured our attention. She generously shared her ideas, especially variations we hadn't considered that helped expand how we'll share our story on our web site."